After an exciting and bloody bank holdup by Lo Lieh and Ku Feng, 1972's The Fugitive gets underway. Liao Fei Lung (Lo Lieh) and Ma Tien Piao (Ku Feng) take refuge at a brothel. There's another shootout and the guys are captured. And beaten. And then they escape. The Fugitive is so short (76 minutes) that it feels incomplete at times -- like something has been cut maybe? Anyway, Liao Fei Lung gets out of jail and Ku Feng's Ma Tien Paio now seems to be in charge. 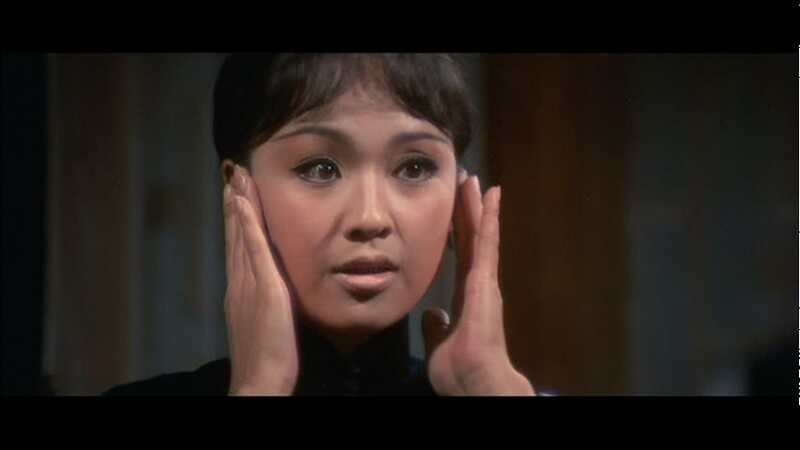 At about the halfway mark of the film, Li Ching finally shows up as Ming Ming, a village girl rescued by Lo Lieh's bandit-with-a-heart-of-gold. I guess I should declare that, since I'm not a fan of John Woo or Sam Peckinpah or Chang Cheh, I was probably not going to enjoy the very 1970s-styled man-on-man violence of The Fugitive and I didn't. The film has some nice imagery but it largely bored me despite an impressive bodycount and a lot of bang-bang and kick-kick going on. I didn't enjoy the film but I did appreciate it on an intellectual level. It doesn't waste time on backstory -- things just kick off mid-action; the short running time makes it more palatable and there is a certain kick to be had from watching spaghetti Western tropes translated to Asia. If you really wanted to get complicated you could say that since The Magnificent Seven (1964) was a remake of Yojimbo (1961) (itself containing elements of earlier Hollywood Westerns), you are watching Western movie elements filtered into Asia in Kurosawa's flick, then back to the West via the Clint Eastwood-starring classic, then filtered back into Asia in a Western-in-all-but-name like The Fugitive. Look for a lot of Shaw regulars in this, including a dressed-up Ouyang Sha-Fei as Lo Lieh's victim in a bank robbery, and a brief cameo by the late Shek Kin. You can order The Fugitive on DVD here.